View of Charles de Langlade's warriors at Braddock's defeat in 1755, by Edwin W. Deming, 1903. 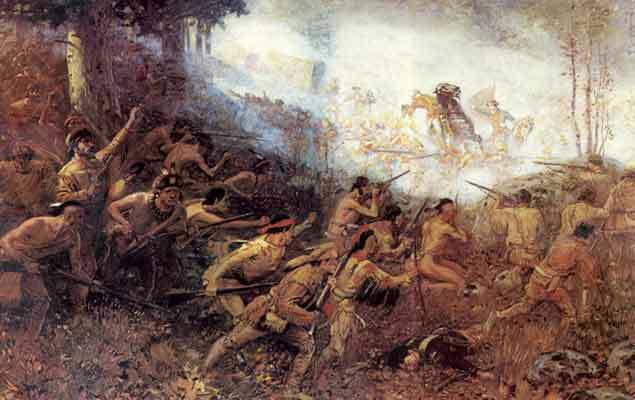 In 1903 the Wisconsin Historical Society commissioned artist Edwin W. Deming to create this painting of Green Bay fur-trader Charles de Langlade and Wisconsin Indians helping the French defeat British troops serving under General Edward Braddock on July 9, 1755 near modern Pittsburgh. French and Indian fighters decimated Braddock's forces in an ambush attack. Mortally wounded, Braddock, pictured falling from his horse in the background, died several days later.